One thing is clear in License to Ensorcell, we’re not in Deverry any longer. Katharine Kerr, bestselling author, takes on urban fantasy with her new series, featuring spunky psychic agent Nola O’Grady in License to Ensorcell. Trouble is brewing in San Francisco and Nola is on Chaos watch. However, when an international serial killer comes to town, Nola’s super secret government agency assigns her to act as the handler for Ari Nathan – an incredibly handsome and impossibly annoying Interpol agent who presents just as many challenges as the killer they are tracking. Nola soon discovers that all of the victims have something in common, they’re werewolves, and these murders may lead to new clues about her brother’s death. However, keeping her mind on the job gets increasingly more difficult as Nola’s attraction to Ari increases, the serial killer sets his sites on her, and her family is inexplicably drawn into her job – three things she is desperately trying to avoid. 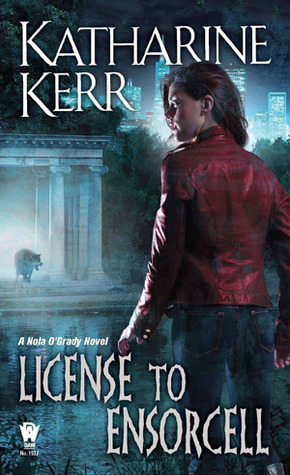 With License to Ensorcell Kerr brings to life an interesting new series peppered with fascinating characters who are sure to generate some terrific Nola O’Grady Novels. As with any first novel in a series, Kerr takes a little extra time to set up the story world including the super secret government agency for which Nola works, the relationships between her very quirky family members, and the general conflict surrounding the balance of Chaos and Harmony. The hunt for the serial killer, even with the werewolf and psychic components, keeps the story moving forward and rooted solidly in the “real world,” especially with the political references to current terrorism issues and to al-Qaeda. However, the storyline featuring Nola and her family is even more engaging. Kerr does a wonderful job of establishing the complex nature of their lives as O’Gradys and the Houlihans struggle to live with their special abilities and to cope with the mysterious disappearance of Nola’s youngest brother. Nola and her talented family are the heart of License to Ensorcell, and this is where Kerr’s work truly shines–this is where the magic happens in more than one way. License to Ensorcell and the forthcoming Nola O’Grady Novels are something to keep your eye on if you’re looking for some “fantastic” fun with a group of quirky characters that will brighten up even the darkest storyline. This series has great potential and should mature into something that brings together readers from multiple genres. I requested a signed copy of License to Ensorcell from Katharine Kerr to giveaway on Goodreads as part of this review. You can enter the contest by clicking the link below. It should be noted that the book being giveaway on Goodreads is unread since I purchased my own Kindle version of the book to read for this review. Giveaway ends April 01, 2011. This entry was posted in Books and Literature, Fantasy, Interviews, Uncategorized. Bookmark the permalink. Ohhhh, hope I win. I love her books. It seems a long time since she’s had a newie! Oh now I’m excited. I loved her Devery series, hated the publishing problems she had with it. So glad she’s still writing. Thanks for posting this! I love her Deverry series and could keep on reading and reading! However, the new series is good too. I hope you enjoy it!